​ " COLA WITH CHRISTMAS "
"Cola with Christmas" started when Rev.Louise got the mandate to act according the dream of pastor Isaac Kamara. He altready shared the dream two times, while he was preaching the wish of feeding 300 Children at Christmas Time and give them that party feeling of a good meal AND little glas of cola or fanta , with it. This to just have no struggles at least at this time of the year. His dream became reality.When Rev Louise one night heard the words COLA WITH CHRISTMAS. Fully awake sitting in her bed and wondered were this was about, her thoughts were led to pastor Isaac kamara his preaching and the dream. So she called him to see how this could be arranged...300 children a plate with rice,chicken vegetables and something special to drink. The first time about 2000 children attended that very first feast. 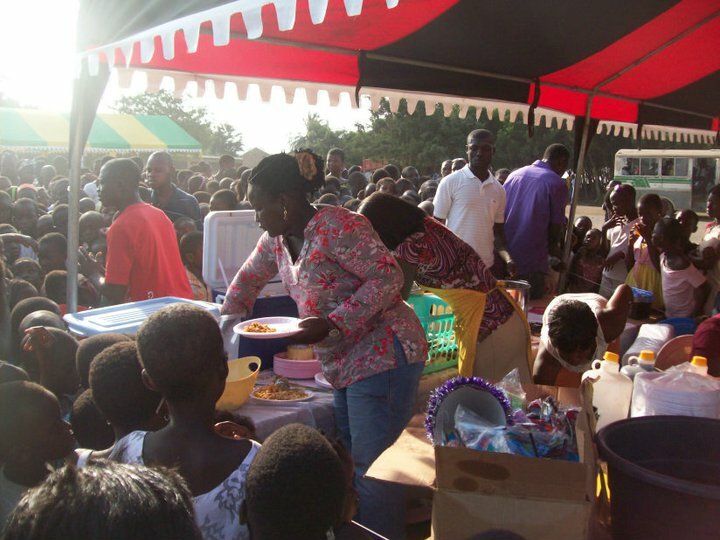 This project for the Children in Ghana has been annually whereby at the end of the year, a party is organized for children from the street and all walks of life to have a glass of “Cola with Christmas”. Every child receives a meal and a nice drink , a day for just being Child- no worries! 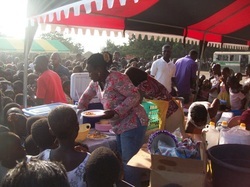 Last years year we were able to feed about 7500 children on Christmas day. We hope that this project will be expanded so that this project will not only serve in Ghana. If you want more information about this project please do not hesitate to contact us. Your gift can be send to STG. GLOBAL CALL MINISTRIES.